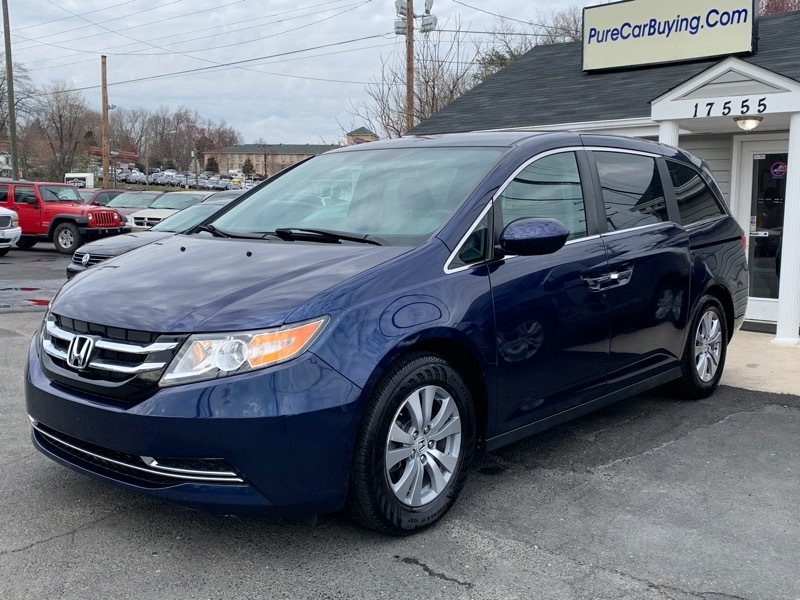 **ONE OWNER** 2016 HONDA ODYSSEY with powerful engine and driven only 39k miles! Fully loaded and much more! CARFAX CERTIFIED**FINANCING AVAILABLE** Contact our Sales at 703-634-2649** ONE OWNER VEHICLE** STILL UNDER MANUFACTURE WARRANTY// BRAND NEW CONDITION SUPER LOW MILEAGE HONDA ODYSSEY SE 8 PASSENGER MINIVAN FULLY LOADED WITH ON BOARD COMPUTER PUSH START BACK UP CAMERA DUAL POWER SLIDING DOORS XM SIRUS SATELLITE RADIO BLUETOOTH ALLOY WHEELS PREMIUM SOUND ALL POWER OPTIONS AUX INPUT BLUETOOTH AUDIO CAPABILITY AND MUCH MORE. WE OFFER COMPETITIVE FINANCING RATES APPLY AT WWW.PURECARBUYING.COM. WE HAVE THE BEST SELECTION OF MINIVANS COME SEE US TODAY! CALL US TODAY TO GET THE BEST DEAL ON A QUALITY PRE-OWNED VEHICLE HASSLE-FREE! AT PURE CAR BUYING WE HAVE YEARS OF EXPERIENCE IN PROVIDING OUR CUSTOMERS WITH THE VERY BEST SERVICE AND STRIVE TO PROVIDE A GREAT CAR BUYING EXPERIENCE. OPEN 7 DAYS A WEEK! MON-SAT 9:30AM-7:00PM AND SUNDAY 11:00AM-4:00PM. NATIONWIDE DELIVERY AVAILABLE/EXTENDED WARRANTIES AVAILABLE. Visit Pure Car Buying online at purecarbuying.com to see more pictures of this vehicle or call us at 703-634-2649 today to schedule your test drive.Additional InformationAlloy Wheels,CD Player,Anti-Lock Brakes,Driver Air Bag,Dual Climate Controls,Power Mirrors,Power Seats,Power Steering,Power Windows,Premium Sound System,Side Air Bag,CD Changer,Traction Control,MP3 Player,3rd Row Seat,Satellite Radio ,Backup Camera,Keyless Entry ,Bluetooth Connection,Power Door Locks,Cruise Control,AM/FM Stereo,Heat/AC ,Auxiliary Audio Input,Steering Wheel Audio Controls,First Aid Kit,Power Brakes,Rear Spoiler,Air Conditioning,Interval Wipers// Please Visit Us At www.PureCarBuying.com.